Connecting a VCR to an HDTV is not much different than connecting a VCR to an old analog TV. Most HDTVs have the older NTSC tuner as well as the newer ATSC digital tuner built-in to the TV. 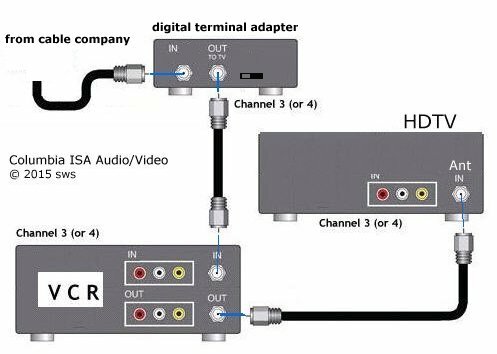 To connect a VCR to a HDTV, you can use the yellow, white and (red) RCA cables, or use a single coaxial cable or use an adapter to convert the RCA cables to HDMI since most HDTVs have HDMI inputs. The Converter takes the RCA cables from the VCR's output and sends to a HDMI cable connected from the converter to the HDTV's HDMI input. Then select the TV's HDMI input and you can play the VCR on the HDTV. The easy single coaxial cable hookup uses channel 3 (or 4) on the TV. Set the TV to channel 3 (make sure to scan for channels on the TV to pickup channel 3 after VCR is powered on, connected and playing tape). You may need to select the antenna input (source) on the TV using the TV's remote. You may need to SETUP the VCR in MENU if not already done. Some VCRs need to be setup when first plugged in before they function properly. OK, so this setup will play VHS tapes on the TV when the TV is set to channel 3 (or 4) but what about connecting my antenna to the TV? I want to be able to watch TV as well as play tapes. Most VCRs will simply PASSTHRU the antenna signal to the TV. Turn the VCR off when watching TV and tune the TV to digital channels using the TV remote. It is like the VCR is not there. Can I record TV with this setup? NO. The VCR tuner will not record over the air digital TV shows. You can record digital TV shows on the VCR if you use a digital to analog converter. Cost is $30 to $40. The VCR single coax cable (OUT) to HDTV (IN) for both video and audio. Don't expect sharp video from this hookup as the old VHS tapes have much less video resolution than today's digital TV broadcasts. 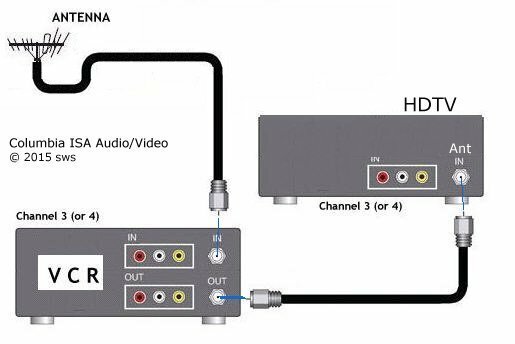 If you have an antenna connected to the TV, you can use more complex connections (see below) or you can use the RCA (yellow, white) connections from the VCR to the TV. In this case, select the input (source) on the TV which matches the VCR connection. RCA cables (yellow and white/red) can be bought at any electronics store or online. Cost should be about $7.00 or less. Today's VCR replacement is the digital TV PVR box or personal video recorder. These units will convert the current digital TV broadcasts into the old analog TV signals for an older TV AND allow you to record the TV show to a solid state recorder or disk via the USB connection. The USB thumb drives or sticks only cost about $15 and have 32GB or more of storage for hours of TV saved on your USB device. No more tapes to rewind. No more tape jams and a lot less space to store TV shows. The boxes only cost $30 to $40, are small and have a remote control. There are many ways to connect a VCR to HDTV. 1. Coaxial cable RF jack (VCR) to HDTV's RF antenna input jack. 2. 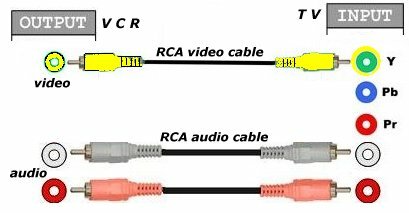 VCR's RCA outputs (yellow, white, red) to HDTV's RCA inputs. 3. VCR RCA outputs to a converter or switch which outputs RCA or HDMI to HDTV inputs. 4. VCR RCA outputs to an Audio/Video Receiver which connects to HDTV. HDTV inputs include composite (yellow, white, red) and component (green Y, blue Pb, red Pr) video. HDTVs often use a hybrid video input which accepts either yellow video or the green (Y) cable video portion of the component video. So if you wanted to connect the VCR to HDTV using RCA cables, connect the yellow video cable to the yellow/green input on the TV and the white and red audio cables to the white and red audio inputs on the TV. The disadvantage here is you cannot use a component video connection to the TV once the yellow cable is connected. Of course HDMI could be used instead of component video. next connect VCR white audio RCA cable from VCR white output to HDTV white audio input. For stereo VCR, connect red RCA audio cable from VCR red output to HDTV red audio input. Switch the TV source to the AV input so the VCR is viewed on the TV. Use TV remote control. What about connecting multiple composite devices to the TV such as video games, DVD and VCR? Don't have enough inputs on the TV? Use a video switch box. This way you can connect many devices through the switch to the single input on the TV. Can I record over the air local digital TV channels on my VCR? I have a VCR and an HDTV. How can I record TV shows on my VCR? The standard home VHS VCR has the older TV tuner built in, which only tunes in the old analog broadcast TV signals which are mostly gone today, replaced by digital TV broadcasts. If you want to record the new digital TV signals, you need to get a DTV converter box. This box (around $40) will convert the TV signals to analog so the VCR will be able to record them. You can view one show on the TV while recording another on the VCR if you connect a splitter. With the hookup above, you can record the TV channel tuned by the converter box or simply watch the TV channel tuned by the converter box. Use the converter box's remote to change channels. The TV is set to channel 3 (or 4) and channels are tuned on the converter box. You could also play a VHS tape to the HDTV. 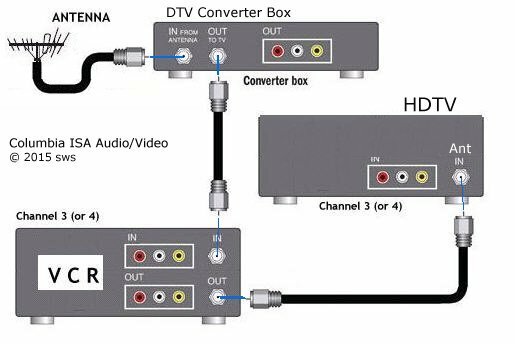 Since DTV converter boxes typically have worse tuners than your HDTV, you could power off the converter box and the VCR when you wanted to view TV channels in High Definition using the antenna pass-thru capability. This time you would use the HDTV's tuner, change channels with the TV remote. The TV source is still the Antenna (TV). Make sure to use TV remote to change to proper source input. For any TV - DTA converts digital cable channels to analog and record on VCR. Instructions for recording one show while watching another using VCR, HDTV and DTV converter box. also your TV antenna, blank VHS tapes and remotes for TV and converter. Very important - Your TV needs to be set on Antenna, TV, or whatever your TV calls the coaxial input. Also your TV will need to be set to channel 3 (or 4) in order to view the VCR or the DTV converter channels. Your TV is set to any other channel such as 12, 24, 36 in order to view TV channels over the air using the TV's tuner. Your TV Antenna is connected to a signal splitter (input) using an RG-6 coaxial cable. It is important to use the proper splitter. Using a splitter not suited for this connection setup could result in poor signal strength and no picture. 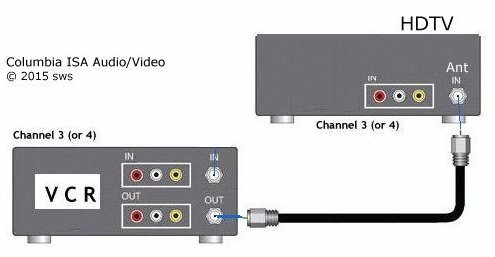 The splitter outputs to the TV coaxial input for straight over the air viewing and also to the DTV converter box input for the second channel (recording). The DTV box provides a channel 3 output to the VCR. Set VCR to record channel 3. The A/B switch allows you to select either the VCR/DTV box tuner or the HDTV tuner (all other channels). You can have cable or satellite TV boxes connected to the HDTV as well, just select the HDMI input on the TV. A VCR cannot record in high definition, only analog standard definition. 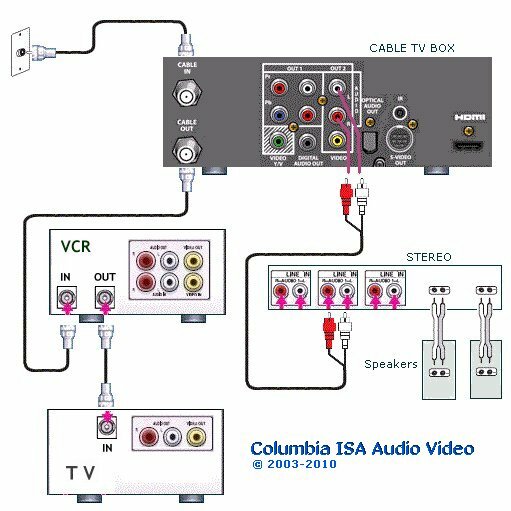 If you have a cable TV or satellite TV receiver box and the box outputs standard definition over a yellow RCA composite video and white and red RCA audio ports, then you can record to the VCR. You can even record a high definition TV show but only in the standard definition conversion available through the yellow video and white/red audio outputs. Below are two options for hooking up your VCR with a Digital Cable High Definition Converter. This hookup is the most basic way to add a VCR to an HD setup. Set your VCR to Channel 3. Your cable TV box must offer an RF output jack. Component video (red, green, blue) cables are used for HD video. HDMI cable connection can be used if HDMI ports are available on the TV and cable box. This hookup allows the viewer to record any Analog or Digital channel off the converter box. For normal HDTV viewing the VCR can remain off. Select the ANTENNA input on the HDTV to view the VCR output. When recording, the converter must stay on the channel being taped. You cannot watch one channel while recording another. Because the signal source is the RF coax connector, there is only monaural audio available. You cannot record stereo or surround sound. A DVR (TIVO) unit can be substituted for the VCR. You can use an HDMI cable connection instead of the 3 cable component video connection. HDMI sends both video and audio all in one cable. Your TV must have an available HDMI input. This installation provides more flexibility, allowing the viewer to record any Analog or Digital program with stereo sound. It also adds the ability to watch any Analog channel while recording any other Analog or Digital program. Your pay TV provider has to offer analog TV signals for this setup to work. Some Cable TV providers still offer analog channels as well as digital channels. The various settings on the HDTV and VCR are listed below. The “VCR / TV” switch will be found on the VCR itself and will select the signal source for the Antenna Out connection on the VCR. The only time it needs to be switched to “TV” is when you want to watch an Analog channel while recording a Digital channel. This hookup diagram shows VCR and older TV set with a stereo sound system for richer audio than TV speakers can provide. The channels are changed on the cable TV converter box while the VCR is set to channel 3 or 4 and the TV is set to channel 3 or 4. When the VCR is not recording or needed, the VCR just passes thru the video and audio to the TV from the cable converter box. The TV is set to channel 3 or 4. This way you can get stereo sound even if your older TV does not have stereo capability. Adjust the volume on the stereo system. You can use any input on the stereo except PHONO. 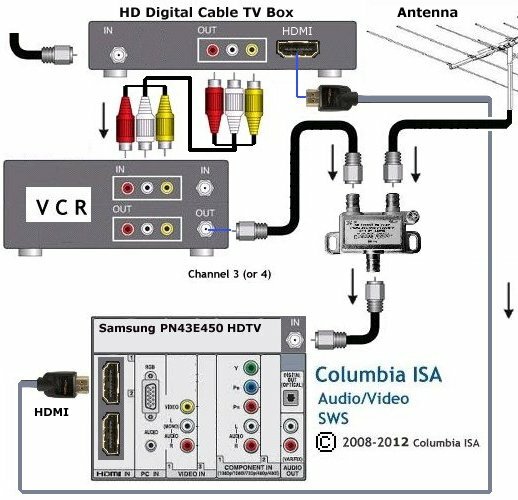 The following diagram shows digital cable TV box and antenna connected to HDTV. Also connected to HDTV is a VCR through a splitter (reversed) to the antenna input on the HDTV. The VCR can record standard definition TV shows from the cable box. The VCR outputs on channel 3 or 4 analog so set the TV to channel 3 or 4 (OTA) when viewing the VCR. The VCR can record one channel from the cable box while viewing an over-the-air (OTA) digital TV station on the TV. There are other options for connecting VCRs. A DVD player can be connected to the TV using the HDMI, component video or composite video inputs on the TV. Can I connect a VCR to a digital TV (HDTV)? Answer: Yes. Connect using the RF antenna jack with RG-6 coaxial cable or connect using the yellow RCA video cable connection with white audio RCA cable connection. My VCR has run out of years. The menu only goes up to 2003. How do I program for recordings now in 2012? Answer: You can setup the VCR for a date (year/month) that is equivalent. The VCR won't know the difference. For example July 2012 is the same as December 2002. It starts on the same day of the week and has the same number of days. It is annoying to do this each month but it does work and if you want to continue to use your VCR for unattended recordings this is one solution. Check the website below for repeating dates. You can enter whatever year and month you want to get the info for. There are some entire years that repeat also so in these cases you only need to set the VCR once per year. How can I record a show while I'm sleeping from my cable TV box to my VCR? Answer: Set your VCR for timer recording. Setup the start time and end time, day and date. Insert blank tape. Next go into your cable TV box's MENU and go to SETTINGS. Most cable boxes have a power on setting which allows a predetermined time to power on. By combining this with a power on channel setting which most cable boxes have, you can have the cable box power on at that time of day and tune to the channel you want to record. There are favorite channels also but usually there is a power on channel, the channel tuned when the box powers on. Set this to your channel to record and both VCR and cable box should come on and you will record your show. Connect video and audio cables from cable box outputs to VCR inputs and make sure VCR is set to record from the LINE input. 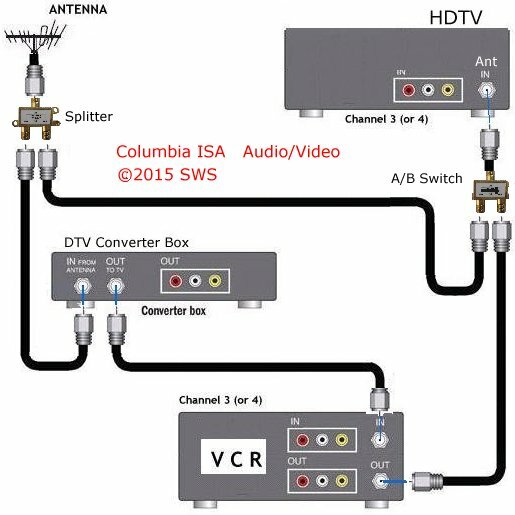 I connected my VCR to my HDTV using coaxial cable but nothing shows up on the TV? Connecting VCR to HDTV using coax cable means you need to tune to channel 3 (or 4) on the TV. Make sure to do a new channel search on the TV once VCR is connected, in PLAY mode and powered on so TV picks up channel 3 and also make sure to switch TV source to ANT/TV using TV remote so you get the correct input source. Check for a bad cable by substituting another coax cable. Try another TV or another VCR if possible to eliminate points of problems. Keep trying different solutions, it will work eventually.